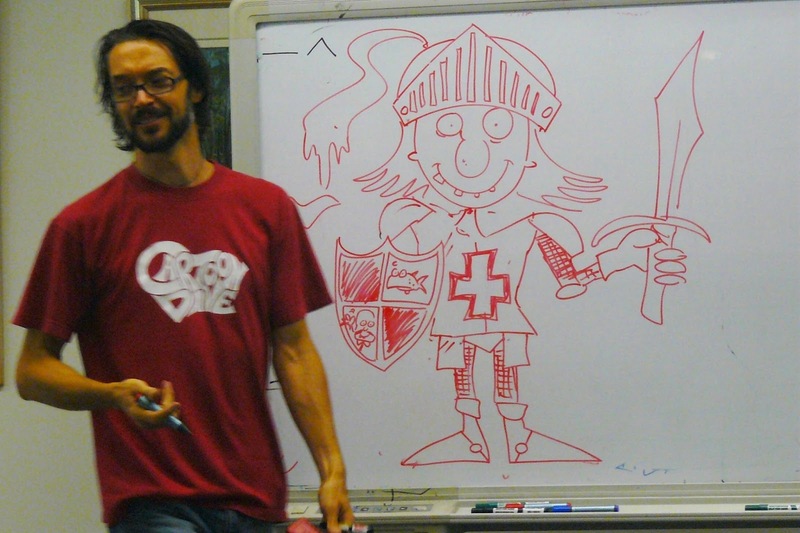 We had 72 excited kids at Trevor’s Drawing workshops this January. Trevor is one of Sutherland’s regular offerings during the school holidays. His dedicated fans follow him everywhere, I guess that’s why his programs fill up so quickly and these latest sessions were no different. Trevor supplies a take-home booklet so that the kids can continue practising their new found skills at home. He also provides sketch paper, pencils and erasers – kids sometimes like to bring their own special coloured pencils. 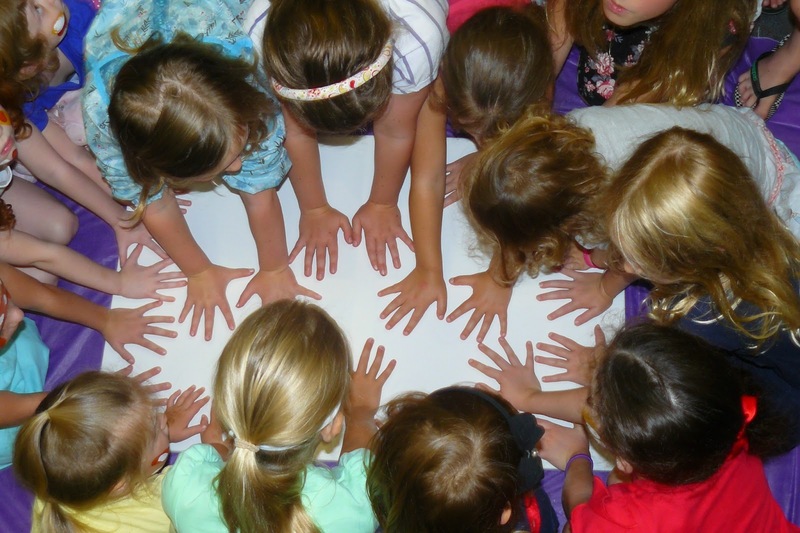 One thing about these sessions is that they can be unnaturally quiet, with heads down, pencils scratching and brows creased with concentration – a bit spooky really! No wonder Trevor keeps coming back for more! Thanks a bunch, Trev. Which one is the Nerdy Knight? Dave Hackett – Cartoonist extraordinaire! A great day was had by all who attended (kids, adults and staff alike) Dave has the uncanny ability to make cartooning look easy and fun! And guess what? It is! But only if you follow Dave’s golden rule – ‘You can NEVER make a mistake when drawing cartoons – mistakes just make your cartoons more interesting!’ And I can assure you, some of Cartoon Dave’s Nerdy Knights and Dorky Dragons were – INTERESTING! Dave had us laughing up a storm with his running commentaries and helpful hints. Thanks again ‘Sir Dave’ we hope to see you again. The entire audience was privileged to witness Wajji-Wahlu-Doongal-Thianni-Bundjulang-Goomaroi or Russell (for short) play his amazing didgeridoo. 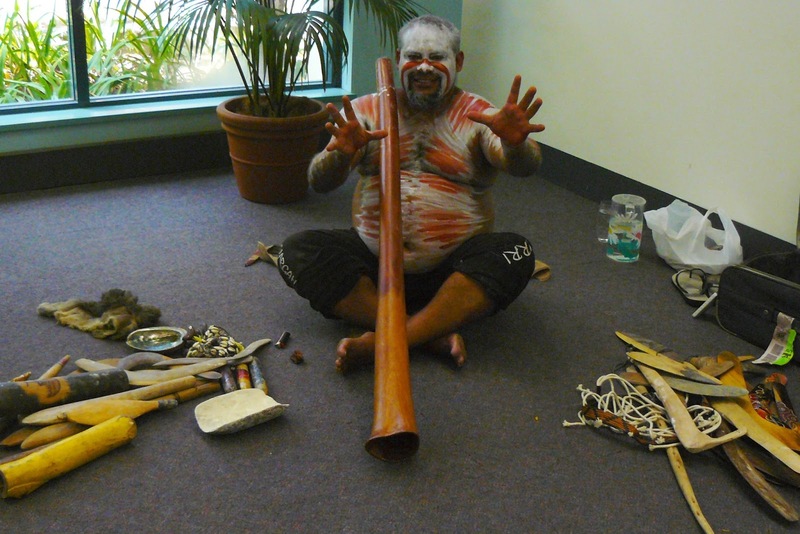 Russell described the animal noises that he was able to make and with the help of hand actions was able to prompt the audience to recognise them as they exited his didgeridoo. 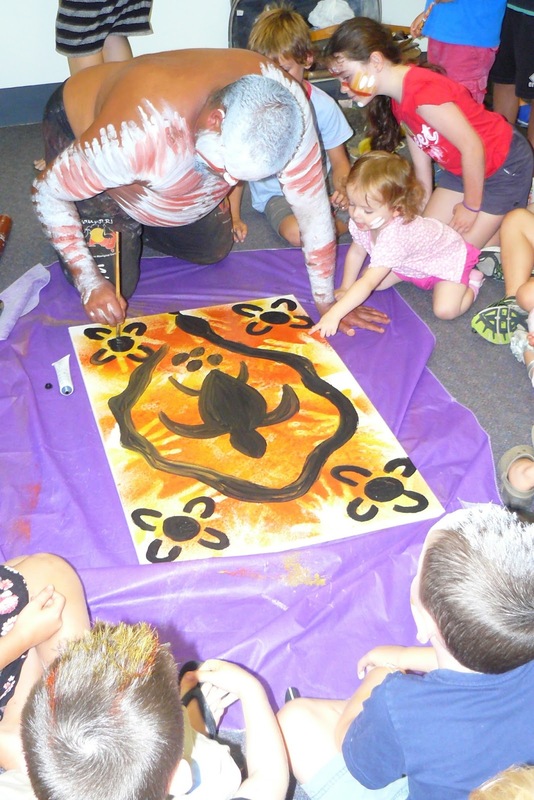 The kids were allowed to handle aboriginal artefacts, be face painted (he’s the fastest face painter in the west), to help contribute to the creation of an aboriginal artwork and to join in on a ceremonial ‘Library’ dance. What a wonderful experience for all those who attended. Parents were very impressed with Russell’s instant kid appeal and gentle humour. Thanks Russell – You were DEADLY! Just a bit more over there. It was a real hands-on experience!